Houseplants are a tried and true way to bring vibrant color to your home and to bring nature inside. Not to mention, plants are a great way to purify the air in your home. Big and beautiful philodendrons and majesty palms are perfect for adding the finishing touch to any room and for filling in empty corners and walls. However, huge plants like that aren’t always the best for tiny apartments and less-than-spacious homes. Thankfully, there are plenty of choices for small indoor plants that can help provide the right touch of green without taking up a large chunk of your room! Small plants, like succulents and air plants, are perfect for adding greenery to your desk or your nightstand. Slightly bigger plants like peace lilies can take up some floor space, but they won’t overwhelm any corner of the room with lush leaves or big roots. The best part about most small potted plants is that they can fit almost anywhere in your home. You can even get creative! Think about adding some cute plants in unexpected places like near your bathroom window, in a hanging planter or even on your wall with a space-saving vertical garden! To help you get started, we rounded up our favorite small indoor plants and included a few tips for styling them in a small space. Take a look and see which ones you can apply to your own space. 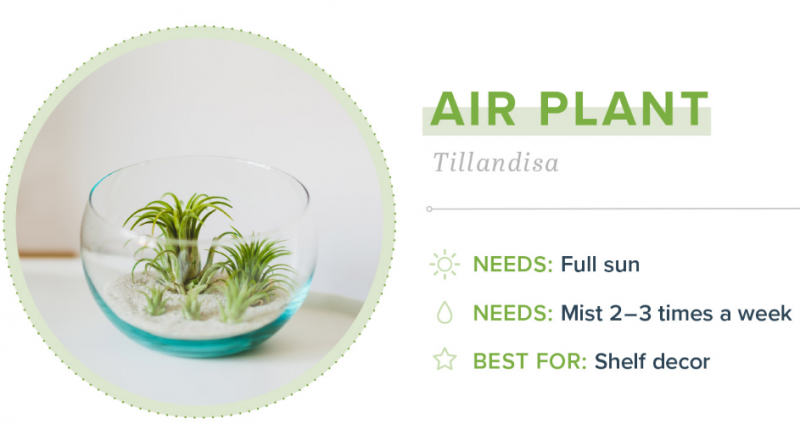 Air plants are interesting plants since they don’t need soil to survive. These are great if you’re looking for a small plant and don’t want to deal with pots or soil. If you choose to house your air plant in a terrarium, make sure it has an opening so it gets plenty of circulation. Did you know that aloe vera plants are a part of the succulent family? Just like their relatives, they enjoy the sun and prefer that their soil is completely dry between waterings. These small potted plants are handy to keep around if you have any minor burns, like a sunburn. Take a look at our list of medicinal plants to see what other plants you should keep around your home. 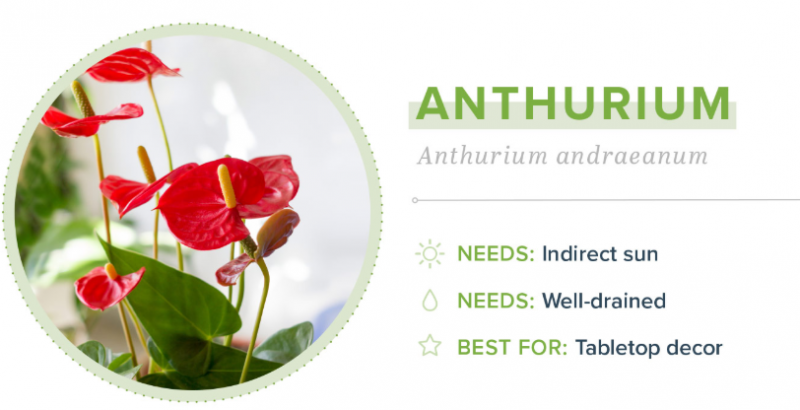 Smaller anthuriums are perfect for adding a bright pop of color to any room in the house without taking up too much space. They can tolerate all types of light, but will grow best with bright, indirect light. Contrary to its name, the asparagus fern is actually a part of the lily (liliaceae) family. If possible, give this plant some breathing room on either side so its leaves can fan out. It will add a beautiful splash of green on any shelf or table. These cute plants also hail from the succulent family. Their name derives from their small stature and resemblance to an infant’s toes. Baby toes are perfect conversation starters due to their unusual look. Cast-iron plants are hardy plants that can withstand a range of light and soil conditions. They’re the plant to choose if you’re willing to give up a little floor space in exchange for a nearly indestructible plant. The echeveria is one of the most common types of succulents. Little plants like these are more commonly found at office and home desks due to their easy care and small size. A common cause of death, however, is overwatering. Make sure to let your plants’ soil dry completely before giving them another drink. 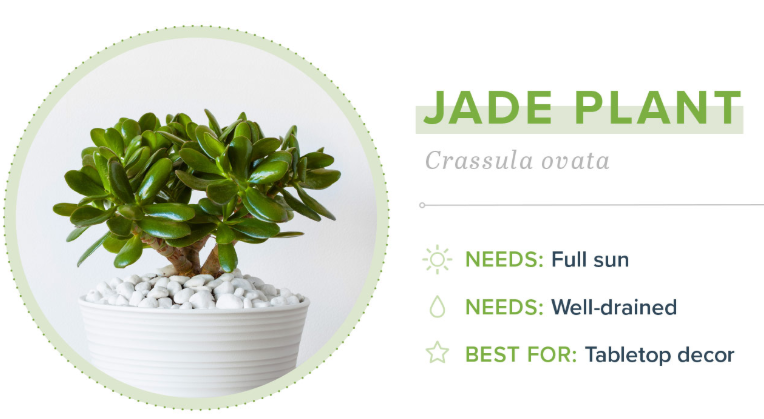 Jade plants are most known for their thick, oval-shaped leaves. Jade plants can live for years as long as they are given the proper care. To keep your plant’s leaves nice and shiny, wipe them down every once in a while to combat dust build up. This will keep the leaves glossy and increase its ability to absorb sunlight. Kalanchoes are a variety of flowering plants that are known for their beautiful blooms. Place them near a window so that they have plenty of energy to flower. The kalanchoe is also from the succulent family, so it prefers to have dry, well-drained soil. 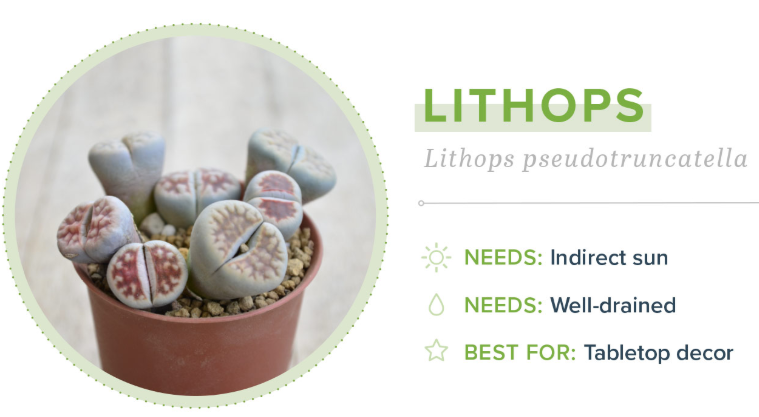 Many refer to lithops as “living stones,” since these plants closely resemble pebbles and small stones. Like succulents, these small plants can survive in hot temperatures and little water. Lithops are great for showing off to guests due to their deceiving appearance! These small plants can grow in both soil and in water. If you choose to grow your lucky bamboo in water, make sure you replace the water every 7 to 10 days and use filtered water if possible. If you plant it in soil, make sure to water it when the first inch of its soil starts to feel dry. 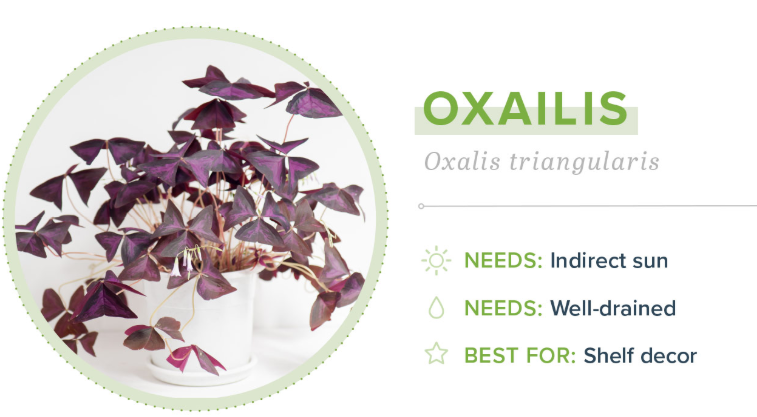 This specific oxalis variety is also referred to as “purple shamrocks” or “false shamrocks.” It earned its name because of its resemblance to the Irish shamrock that is more commonly known as the three-leafed clover. In addition to its name, its also known for its photophilic nature. This means that both its flowers and leaves open and close in response to light. Peace lilies are one of the best houseplants you can have in your home due to their variety of sizes, attractive appearance and ability to clean the air. Peace lilies can also thrive under fluorescent light, so they’re perfect for rooms that have little to no natural light. Take a look at our peace lily care guide to learn how to help them thrive. 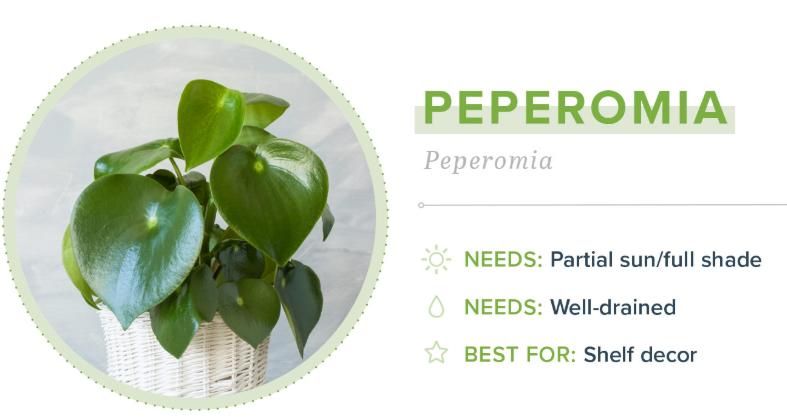 Peperomia leaves grow in tight clusters, making them ideal choices for small shelves or desks. Their thick leaves can hold water and allow them to endure periods of time without hydration. They can also survive under fluorescent light, but grow best with bright, indirect sunlight. Polka dot plants are colorful plants that provide an unexpected dash of color to any shelf or tabletop. These small plants are commonly known for their pink color, but they have more recently become available in other colors (like red and white). Although it prefers indirect sunlight, some direct sunlight during the day is okay for your plant if it isn’t very colorful yet. Just remember to bring it back out of the direct sunlight to avoid scorched leaves. Pothos plants are vine plants that can easily dress up a bookcase or a plain wall with their trailing leaves. They are another popular plant that purifies the air. Their classy appearance and air-purifying abilities make them a good choice for a home office or living room. 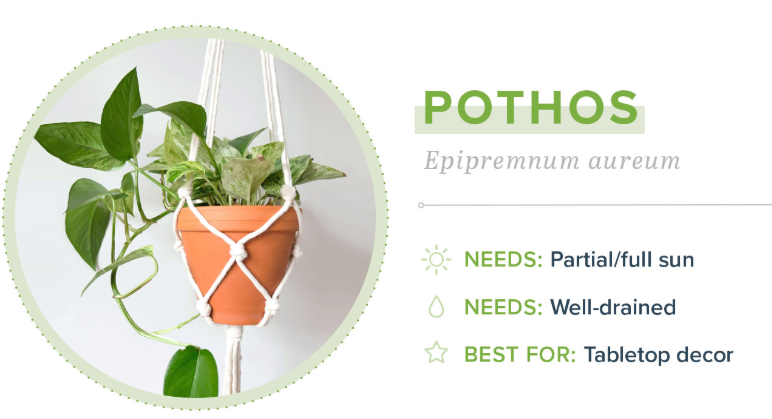 Take a look at our pothos plant care guide to learn more in-depth information about their care guidelines. Rubber trees are indoor plants that can pull any room together with their large leaves and vibrant color. Rubber trees can potentially grow up to ten feet tall. To keep them at a smaller height, prune the branches and leaves regularly. New branches can sprout from these prunings if you tend to them. Snake plants are easy to care for and are also useful for purifying the air. These plants grow vertically, so they’re ideal for tight corners that are in need of some greenery. Snake plants can grow in a variety of light conditions, but thrive best in indirect sunlight. Since they originate from the desert, they can also withstand long periods of time without water. You should let their soil dry between waterings. 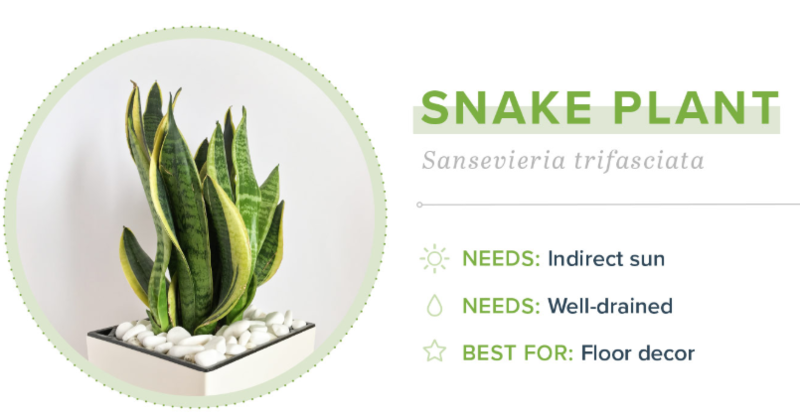 Take a look at our snake plant care guide to learn more in-depth information about snake plants. 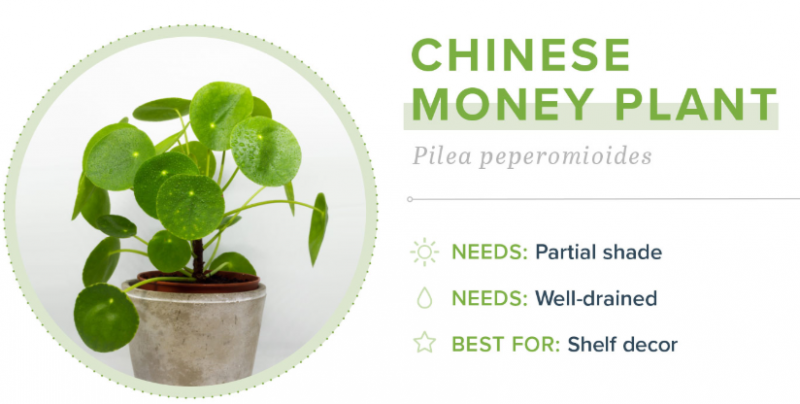 These plants have a lot of long, skinny leaves that poke out from their pots. Spider plants make interesting hanging plants thanks to their dangling leaves. The spider plant’s other nicknames include the “airplane plant” and the “ribbon plant” — thanks to its iconic foliage. 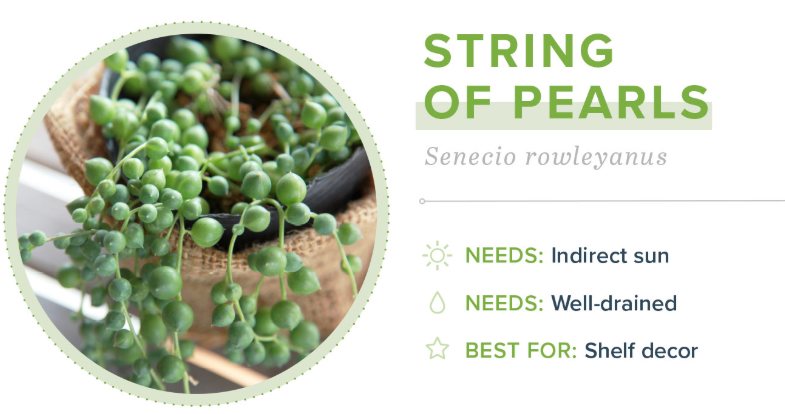 The string of pearls plant is an increasingly popular plant with a unique appearance. Its pearl-like foliage hangs over its container and makes an eye-catching piece of decor for all of your guests. This cute plant is yet another member of the succulent family and thus requires lots of light and little water. A lack of space is an invitation to get innovative and see how you can add foliage to your home! You can keep it simple with a few small potted plants or get creative with a wall gardens to take advantage of your vertical space. Small DIY projects like modern plant terrariums and kokedama string gardens are other ways to incorporate small indoor plants into your tiny space. Look through our tips and tricks to see how you can take advantage of your small space. Take advantage of your wall space with a wall garden made of your favorite plants. Succulents, air plants and other cute greenery can spice up your wall decor. Small end tables and nightstands are perfect for adorning with cute greenery. Pair your plant with a stylish pot and trendy table decor to complete the look. Macrame plant hangers are cute and fun alternatives to display your plants without using precious floor space. Plants that work well on shelves also typically fit in hanging planters. Trailing vine plants like ivy can tastefully add greenery to a bookshelf or wall. The beautiful leaves uniquely decorate your space with classy texture. Small indoor plants are some of the most versatile greenery you can find. Start by picking out a few of your favorites to see where they can fit. From there, you’ll get an idea about what works best in your space and what other plants you want to add! If you’re up for getting a little more creative, why not try your hand at making a DIY ladder plant stand or DIY succulent wall garden? These projects allow you to have a fun indoor garden without taking up too much space! Unique wall and hanging planters are the way to go if you’re tight on floor space. Great, informative article! Well researched, however I’m wondering if your scientific name for the Rubber Tree plant is correct. Hevea brasiliensis does share the common name of Rubber Tree or Rubber Plant. The Rubber Plant/Tree generally sold as a houseplant is actually a form of a fig, scientifically it is Ficus elastica. Comes in great colors, and is easy care.